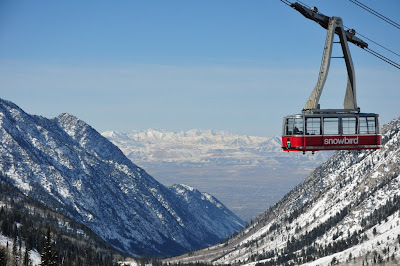 Snowbird is an incredible place to ski. 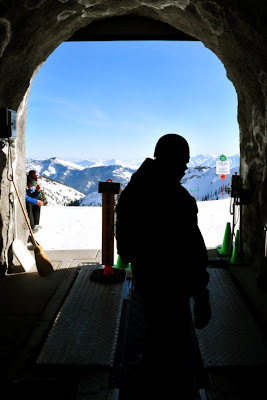 The terrain is vast and skiers use all available resources to maximize the quality of their day. If the high ridges and runs are open, hiking is a fine option. If the high ridges and runs aren't open, waiting for ski patrol to open them and then following them right up the mountain also works. 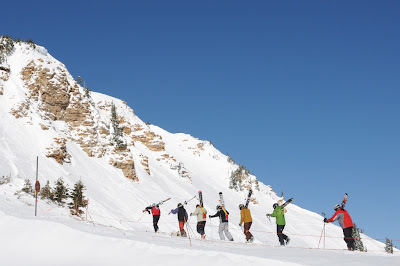 Ski patrol likes to break trail. Another popular option is to take the very European tram to the top. 125 skiers cram their way on and then zoom zoom, they are at the top. Mountain in the way of you getting to the backside? Snowbird took care of that by carving out a tunnel and installing the always enjoyable magic carpet.